The Web Marketing Association is pleased to announce the call for entries for The 23rd Annual International WebAward competition. It recognizes the individual and team achievements of Web professionals in 96 industries all over the world who create and maintain outstanding Web sites. 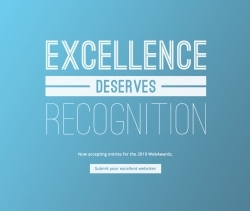 The deadline for entry for the 2019 WebAwards is May 31, 2019. Boston, MA, March 11, 2019 --(PR.com)-- The Web Marketing Association is pleased to announce the call for entries for its 23rd Annual International WebAward competition. The WebAwards are the standards-defining competition that sets industry benchmarks based on the seven criteria of a successful Web site. It recognizes the individual and team achievements of Web professionals in 96 industries all over the world who create and maintain outstanding Web sites. The deadline for entry for the 2019 WebAwards is May 31, 2019. A complete list of past winners and this year’s entry form can be found at www.webaward.org. The competition’s highest honor, the 2019 WebAward “Best of Show,” will be given to the one site that the judges believe represents the pinnacle of outstanding achievement in Web development. Last year’s Best of Show winner was presented to Chris Curd Design Ltd for their outstanding work on Where Wise Men Fish. The site was also recognized as Best Sports Website. The Web Marketing Association will also recognize the interactive agency winning the most awards in the competition with the “Top Interactive Agency” WebAward. TopSpot Internet Marketing was named Top Agency at the 2018 WebAward Competition, taking home 7 WebAwards last year. The Top Agency Award is given to recognize the consistently outstanding development going on at interactive firms. Judging for the 2019 WebAwards will take place in June through August and winners will be announced in September. Judges will consist of a select group of Internet professionals who have direct experience designing and managing Web sites, including members of the media, interactive creative directors, site designers, content providers and webmasters – with an in-depth understanding of the current state-of-the-art in Web site development and technology. Past judges have included top executives from leading organizations such as Universal McCann, SapientNitro, T Rowe Price, Bridge Worldwide, Disney, Euro RSCG, Boeing, Huge, ING Direct, VML, Facebook, J. Walter Thompson, Gartner, Possible Worldwide, YUM!, Cuker Interactive, PayPal, Razorfish, Munich Re, Refinery, Ernst & Young, Magellan Health Service, Microsoft, R/GA, Family Cookbook Project, Saatchi & Saatchi, SAP, Starwood Hotel, and Website Magazine.